Captain John Enderle, commanding officer of Troop D, Springfield, announces the kickoff of the 12th Annual Corporal John A. “Jay” Sampietro Jr. Toy Drive. 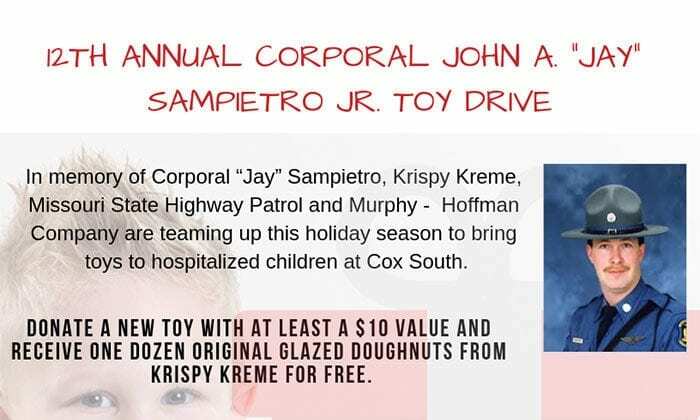 This toy drive, in remembrance of Corporal Sampietro, who died in the line of duty in 2005, will begin on Wednesday, November 21, 2018, and will conclude on Wednesday, December 19, 2018. The public and media are invited to share in the kickoff of the toy drive at 10 a.m., November 21, at the Springfield Krispy Kreme location, 3860 S. Campbell Avenue, Springfield, Missouri. 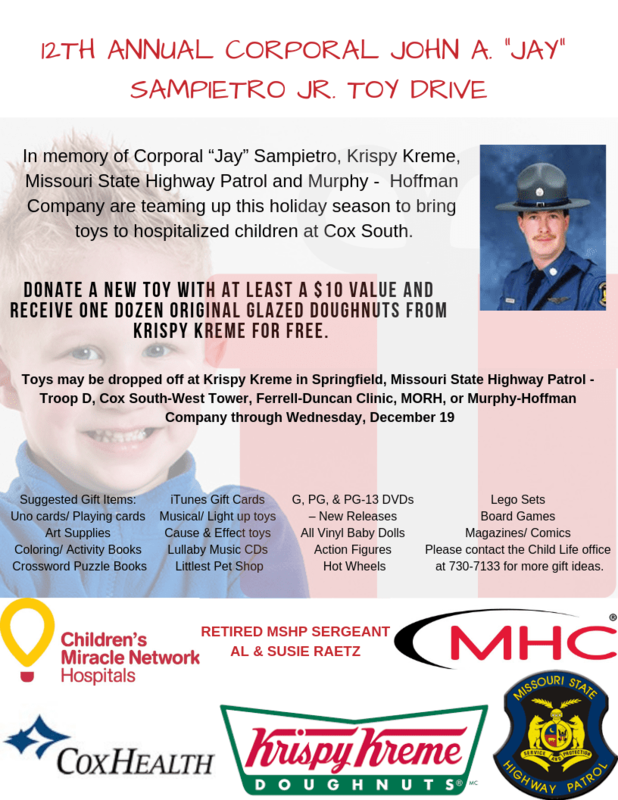 The toy drive is a cooperative effort between the Missouri State Highway Patrol, Krispy Kreme Doughnuts, the Children’s Miracle Network Hospitals at CoxHealth, Murphy-Hoffman Company (MHC), and the citizens we serve. The toy drive is also designed to brighten the holiday for children who are forced to spend the Christmas season in the hospital. Troopers will personally deliver the donated toys to the Cox Health Pediatric Unit in Springfield on December 19, 2018. Anyone who donates a new, unwrapped toy valued at $10 or more, will receive a free, dozen original Krispy Kreme glazed doughnuts. Toy needs include coloring/activity books, board games, Hot Wheels, action figures, age appropriate DVD movies, small handheld electronic games, Legos, art supplies, blocks, or infant toys. CoxHealth also meets the needs of children in the hospital through its Child Life Services, which helps ease anxieties and answer questions for them and their families. While the toy drive caters to the children admitted to CoxHealth Children’s Hospital during the holidays, Child Life Services works to put a smile on both the children’s and their parents’ faces throughout the year. To support Child Life Services as part of the 12th Annual Corporal John A. “Jay” Sampietro Jr. Toy Drive, please contact Racheal Adegboyega, Director of Sponsor Relations, at Racheal.Adegboyega@coxhealth.com.